Summer recipes? summer fish pie,salmon quiche and lamb provençale! 1)Heat the stock in a small pan and add the salmon and pollack. Simmer gently for 5 mins, then turn off the heat and leave to sit for 5 mins more. Remove the fish, keeping the stock, and flake into large chunks, removing bones as you go. 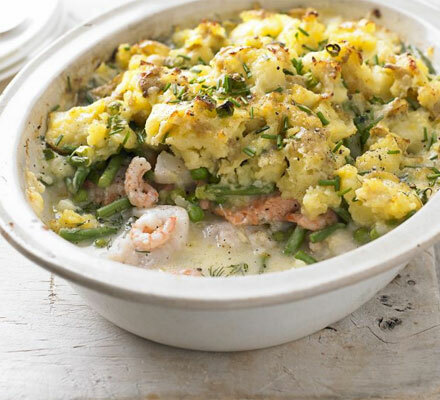 Spread onto the base of 1 large or 2 smaller overnproof dishes with the prawns, peas, dill and green beans. 2)Pour the wine, reserved stock and cream into a pan and simmer to reduce a little. Mix the cornflour to a paste with 1 tbsp of the sauce and whisk back into the sauce, simmering until thickened. Pour over the fish and veg and leave to cool a little while you make the topping. 3)Boil the potatoes in salted water until tender, about 10-15 mins. Drain and steam-dry for a few mins, then return to the pan with the olive oil, spring onions and half the cheese and chives. Season, crush lightly with a fork or potato masher, then spoon over the fish. Sprinkle on the remaining cheese and chives. 4)To eat straight away, heat oven to 220C/200C fan/gas 7. Cook for 25-30 mins until the topping is golden and filling bubbling. To freeze, allow pies to cool completely, then wrap well and freeze. Defrost fully overnight and cook as above, just adding 10 mins to the cooking time. Or cook from frozen: cover with foil and cook at 180C/160C fan/gas 4 for 1 hr 45 mins, then remove foil and turn up to 220C/200C fan/gas 7 for 45 mins more, ensuring it is piping hot before serving. Now- for our second fish recipe of the day- smoked salmon quiche 🙂 very summery, refreshing and delicious. 1) Roll out dough into a 12-inch circle. Place it into a 10-by-1 1/2-inch round tart pan (with or without a removable bottom), pressing dough into corners. Place in freezer to chill for 30 minutes. 2)Preheat oven to 190c°. Line pastry with aluminum foil or parchment paper, pressing into the corners and edges. Fill at least two-thirds with baking weights – dried beans, rice, or ceramic or metal pie weights. Bake first for 15 minutes, remove from oven and let cool a few minutes. Carefully remove aluminum foil or parchment paper and weights. Poke the bottom of the pie pan with the tongs of a fork (fork holes are for any air to escape) and return to oven. Bake for an additional 10 minutes or until just lightly golden. Place on a wire rack to cool while making filling. 4)ine the bottom of the quiche crust with cooked shallots. Put one layer down of half the smoked salmon and goat cheese. Pour half of the egg/milk/cream mixture over the salmon and goat cheese in the quiche shell. Layer down the remaining salmon and goat cheese, and pour the remaining egg/milk/cream mixture over it. Transfer to oven. Bake at 190c° until just set in the center, about 30 to 35 minutes. Remove from oven and cool on a wire rack for 15 minutes before serving. To prepare the herb crust, break the bread into large pieces and place in a food processor or blender and turn into fine crumbs. Add the herbs and garlic and blitz for a further 30 seconds. Heat the oil in a large pan with the butter until foaming, but not coloured. Season the racks and add to the pan, skin-side down, and cook for 3-4 minutes on each side (for medium rare). Remove from the pan and leave to rest for 5 minutes. 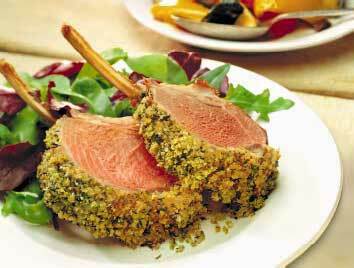 Place the racks of lamb, fat side up, on a chopping board, and brush the mustard over the racks, to apply a good coating. Press a generous handful of the herb crust over the racks and transfer to a medium-sized roasting tin and roast for 5-15 minutes, depending on how your lamb is preferred. Cover the bones with foil if browning too quickly. To make the jus, heat the stock and rosemary in a pan over a medium to high heat and reduce by half, stirring occasionally. Check seasoning, strain and keep warm. Slice the racks in half and serve immediately with some vegetables you like, or simple ratatouille. disclaimer- I am not the author or owner of any pictures added in this blog. Everyone has their comfort food. Something you have after you’ve come back home after a long time of not being there..or you just need this homey feeling in your tummy 🙂 for me it’s definately pasta. Pasta bolognese is filling and so delicious.Simple to make as well. This is an authentic italian recipe, which I’ve learned from my grandmother,and which she has learned from hers- and she was italian, so I’ll trust her that it’s authentic. let’s start! how to make it? well.. heat up a big sauce pan with a tiny bit of olive oil in it and fry off the meat. try to separate big clumps with a spoon- big chunks of meat in the sauce are not yummy. when the meat is starting to turn brownish, add salt,pepper, paprika powder,chili, crushed garlic, dried herbs(rosemary,oregano,thyme,basil) and vinegar. allow the vinegar to evaporate. now add all of the veg ( onion, carrot, celery) and sweat them off. we want them to ooze lovely juices into the meat. once they’ve soften a little bit, add the wine. ( 1 glass) let it reduce, add the tomato purée , stir through. then add the stock and canned tomatoes. throw the bayleaf in.simmer on medium heat for good 40 min ( you want the veg to fall apart, meat has to be luciously tender and the sauce has to just blend alltogether instead of seeing the individual chunks in it). when the sauce is ready, turn the heat off, and stir through fresh basil (optional) toss the pasta with the sauce. serve hot, with some parmezan cheese on top. Nothing can beat it… simply gloriously delicious! 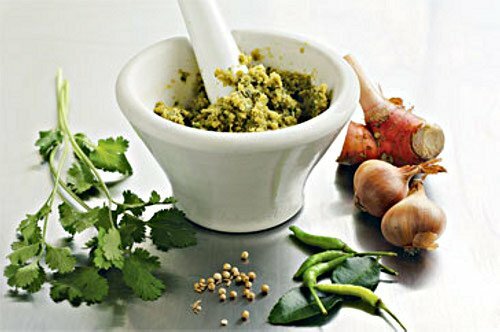 Thai Green Curry – a quick&easy taste of Thailand. Who doesn’t like a good curry? I think we all do. I love indian and thai curries, but I don’t always have two hours to make them.sometimes I want something to eat and I want it fast. That’s when I make a thai curry. I make my own curry paste in advance, and I never have to worry about whipping up a dinner in 20 min! here we go..
2 big green chillies- de-seed if you don’t like so much heat. so…what you do is just roughly chop all those things and then blend them all together until they make a paste 🙂 done, how easy is that? if you want to make a red thai curry paste, add red chillies instead, 1 tsp of tomato purée, I add a tsp of smoked paprika powder, the rest remains the same. then-you have a red paste. You can blend the ingredients or use a mortar. it really doesn’t matter. they also have a red curry paste variant. 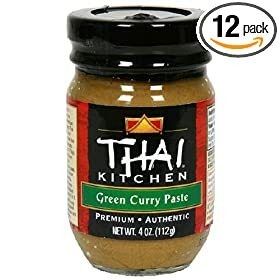 Now, we have our paste..how do we make a curry? so simple. it’s going to be a chicken curry, with a few veg..
so..we heat up a deep pan. we add a tad of oil into it. then we add 2 heaping spoons of curry paste and stir it through to losen it up and warm the spices through to start doing their magic. we throw the chicken in. after it’s browned, we add the spring onion and the veg. we sauté them off for 2-3 more minutes. we add the milk and stir the whole thing, so the paste and milk combine and make sauce. when the chicken is cooked through and veg is cooked but still crunchy, turn the heat off and add the fresh corriander. serve with rice. it’s so soooo good! It took me years to perfect my goulasch soup recipe. This is the ultimate version. I can promise you, I never had anyone dislike it..and they’d usually go for seconds and thirds- I guess that’s a good sign. It’s a bit of work,but it’s totally worth it. the effect is mindblowing! how to make it? well, dice the beef in about 3×3 cm cube, fry it off adding pepper,paprika,chili, on a bit of olive oil, just to brown it and put it aside. on the same oil, sweat off the carrots,celery,onions. season with salt and pepper.add tomato purée,canned tomatoes,and throw the beef back in.add the stock and bayleafs. let it come to the boil, add garlic,cumin(some other spices you like f/e corriander powder, onion powder, a pinch of marjorie,thyme). let it simmer for about 1 hr 15 minutes minimum. I let it simmer for about 90 minutes to make sure the beef is just melting in your mouth. the beef needs that time to get tender,as we’re using stew-sort of beef! (stir around every now and then) about 30 min before the beef is done- throw in the diced potatoes and peppers- the potatoes will cook and the peppers will stay in tact. finish off with lemon juice. season to taste if still needed. how to serve it? well, of course in large bowl, with a piece of bread. what I like to do is to put some sour cream and some shredded cheese on top of my portion. it’s heavenly. always a winner! enjoy it guys! So..how do we make it? first of all, bring the stock up to the boil, add the cut brocolli to it, as well as the spring onion. simmer until brocolli is cooked-not mushy like baby food though 🙂 about 10 min is enough. add minced garlic. blend the soup until smooth. season to taste wtih salt and pepper, in the end- add cream, it will make the soup wonderfully lucious. You can top the soup with cheese-like I do, but it’s optional, you can use garlic croutons, some freshly chopped spring onions, crispy bacon, or whatever you like really. you can leave it pure if you like. 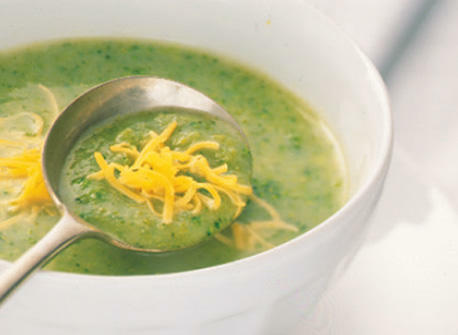 it’s all up to you- that’s why this soup is so great, it’s very versatile. you can also replace brocolli with any other veg you like- according to your mood.. for example- peas,aspargus,caulliflower,carrot,pumpkin 🙂 it’s all healthy and delicious, good luck with it. Delicious summer dessert- eton mess. This is a delicious,light summer treat. bags of flavour,fresh fruit.. simply glorious, and so sooo easy to make. 1 big meringue per person. marinate the strawberries in sugar, vanilla and liquieur. leave them for about 10 min in the fridge. crush the meringues into smaller and bigger chunks( you don’t want just powder, leave some bigger pieces in it too). Mix meringue with the cream- gently , don’t knock the air out. drain the fruit, and mix them through. spoon into glasses. you can add a few chunks of meringue and a spoonfull of the strawberry liquid, before serving:) so good! Sweet&spicy tomato pasta sauce with black olives, garlic&chili! preparation: – boil the water for the pasta, toss the pasta in, and while it’s cooking- prepare the sauce. fry off the shallots with garlic on some olive oil. add the olives- I slice half of them, and throw few whole ones for the visual effect. throw in d cut tomatoes.season with herbs,salt,pepper…if you think your tomatoes are acidic, balance it out with some sugar. add chili paste. stir. let it simmer for about 5-7 min. let the tomatoes ooze their juices. you can add about 100 mls of water to create more sauce. toss the cooked pasta with the sauce.turn the heat off,add the roughly chopped basil and mozarella.toss, throw onto a plate. ( decorate with basil if you have the time and patience :P) ! can’t beat it!